In her wildest dreams, Ophelia Montague never imagined she would leave the city, her friends, her school and move to a seaside village. But when her parents die in an accident, that’s just where she finds herself – ensconced in a rambling house on the beach, with her uncle Sebastian, his boarder – nineteen-year-old Adam Ferrier, and two Great Dane dogs named after shipwrecks. By the ocean's edge she meets Jack Denham who seems to command the sea and the moon—and if he has his way—Ophelia, too. 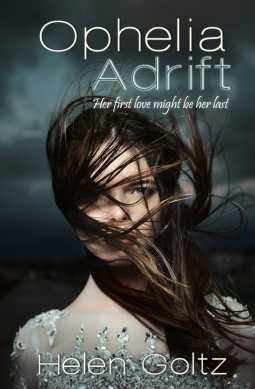 The cover of Ophelia Adrift caught my eye and I was dying to see what it was about. The blurb left much to the imagination, and the story much disappointment. I almost didn't continue reading the story because it's underdeveloped. Helen Goltz had all the right ideas, but the execution does not make for an enticing read. The biggest setbacks to any story are underdeveloped characters and unrealistic dialogue. When the dialogue doesn't reflect individual personalities, or even sound like normal a normal teen, it makes a story seem like the work of an amateur. Ophelia was torn apart and distracted by the death of her parents, but despite finding a love interest and making a place for herself in her new home, she didn't develop past that. She just became obsessed with a mysterious and shady character. I have a hard time relating to a selfish character that is also written to gain sympathy, it just doesn't work unless the character is also self-aware. The events leading up to the ending were convenient and blatantly transparent to the furthering of the plot. There was no real sense of suspense because everything about the mysterious connections between Jack and the history of shipwrecks was obvious to readers. Somehow, though, it skirted past Ophelia's notice until very near the end. The climax of the story happens so fast and it's so discombobulated you wonder whether it happened at all. No point in picking up the pace towards the end of the story after dragging out the predictable parts. This is the first novel I have read from Helen Goltz, so I didn't know what to expect. I haven't been taken with this novel but I'm hoping, for readers who loved it, that the next in the series, Ophelia Aground, will be better. Ophelia Adrift is a great idea, but missing that 'WOW' factor.